Some good news for Guitar Hero fanatics. 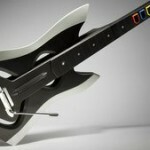 Two new titles were revealed by Activision, the DJ Hero 2 and Guitar Hero: Warriors of Rock. Both games will hit the stores later this year and will have new game modes and much more game play! DJ Hero 2 will introduce microphone support in the new series letting players sing along with the lyrics on the screen. There is a new career mode and multiplayer modes which include not one but two turntables at once. The new Guitar Hero will feature an in-depth story mode and a new customizable guitar controller. The new guitar is what I like the most. It will feature removable wings and lets you customize the look and feel of the controller. The electronics are kept in the middle of the guitar which means the body can be switched and changed at will. Guitar Hero is one of the most sold games ever and these new additions are only going to generate more interest and much needed attention. While Sony, Microsoft and the Wii have gained some market attention and curiosity with new releases and potential releases this year, Guitar Hero’s additions will only add more competition to an already competitive market.